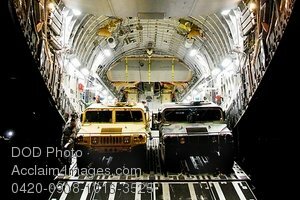 Description: Free, public domain image: Army Humvees Being Loaded Onto a Carrier Plane. Airmen from the 621st Contingency Response Wing at McGuire Air Force Base, N.J., load two Army Humvees onto a C-17 Globemaster III June 26 during a noncombatant evacuation exercise at Mackall Army Airfield, N.C. During the exercise, CRW Airmen onloaded and offloaded more than 1,500 passengers and 75 short tons of cargo and equipment. (U.S. Air Force photo/Staff Sgt. Nicholas Phelps.